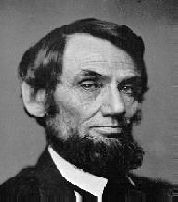 This site reprints Abraham Lincoln's 12 January 1848 Speech in Congress, questioning the U.S. war of aggression to seize Texas, California, and other southwest land areas. The President had lied the U.S. into a war of aggression, to support the South's expansionism goal. Someone was needed to speak out. Fortunately, some months after then President James K. Polk had started the war, Lincoln was elected to Congress, effective December 1847. He examined the "evidence" as alleged by President Polk and raised issues of Presidential honesty and mental judgment. Bottom line: the President had lied the U.S. into war. Bribery was used to get Congressmen to vote to annex Texas, @ $50,000 a vote, said Rep. Joshua R. Giddings, History of the Rebellion (1864), pp 326-327. General Ulysses S. Grant identified the U.S. Aggression War Against Mexico as “one of the most unjust [wars] ever waged by a stronger against a weaker nation. . . . The occupation, separation, and annexation [of Texas] were, from the inception of the movement to its final consummation, a [slave-power] conspiracy to acquire territory out of which slave States might be formed for the American Union [U.S.A.]. Even if the annexation itself could be justified, the manner in which the subsequent war was forced on Mexico cannot. . . . The Southern Rebellion was largely the outgrowth of the Mexican war. Nations like individuals are punished for their transgressions. We got our punishment in the most sanguinary [bloody] and expensive war of modern times. . . . United States troops . . . were sent [by President Polk] to provoke a fight [war]. . . . Mexico showing no willingness to come to the Nueces [River] to drive the invaders from her soil, it became [policy] for the [U.S. troops] to approach [aggress even further, i.e., to ] . . . occupy a [still-deeper-into-Mexico] position near the largest centre of population possible.”—Grant's Personal Memoirs (New York: C.L. Webster & Co, 1885-1886), Vol. I, Chapter II, pp 53-56, et seq. “In Grant’s view, shared by many Americans, the war was indefensible because it pitted a strong nation against a weak one in an act of bullying aggression that portended the spread of southern slavery into the conquered areas. . . . When Mexico refused to accept the U.S. annexation of Texas in 1845, war clouds gathered. The Mexican government rejected a border on the Rio Grande, not least because it foreshadowed American expansion all the way to California. . . . the Whigs, led by Henry Clay, but also a young freshman Congressman named Abe Lincoln, hotly opposed war with Mexico as utterly incompatible with American values. . . . Resistance to the Mexican War was substantial; anti-war Whigs viewed it as hypocritical and ruthless, certain to end badly, even if the U.S. won. We would absorb hostile populations, earn international opprobrium, and perhaps lurch into a war with Great Britain . . . [James K.] Polk was a hugely controversial president. Viewed as a prevaricator and an opportunist, using foreign wars to increase his power and luster, even the victorious troops came to despise him. When rumors reached General Zachary Taylor in Mexico that Polk had died in office, he jotted: “'while I regret to hear of the death of anyone, I would as soon have heard of his death as that of any other individual in the Union. '” (Quoted from Review by Geoffrey Wawro of the book by Prof. Amy S. Greenberg, Ph.D., A Wicked War: Polk, Clay, Lincoln, and the 1846 U.S. Invasion of Mexico [Alfred A. Knopf/Vintage Books, Fall 2012]). Some, if not all the gentlemen on, the other side of the House, who have addressed the committee within the last two days, have spoken rather complainingly, if I have rightly understood them, of the vote given a week or ten days ago, declaring that the war with Mexico was unnecessarily and unconstitutionally commenced by the President [James K. Polk]. Ed. Note: Back then, the anti-war opposition had had the courage to oppose the war, even declare that the President's war had been "unnecessarily and unconstitutionally commenced." I admit that such a vote should not be given, in mere party wantonness, and that the one given, is justly censurable, if it have no other, or better foundation. I am one of those who joined in that vote; and I did so under my best impression of the truth of the case. How I got this impression, and how it may possibly be removed, I will now try to show. When the war began, it was my opinion that all those who, because of knowing too little, or because of knowing too much, could not conscientiously approve the conduct of the President, in the beginning of it, should, nevertheless, as good citizens and patriots, remain silent on that point, at least till the war should be ended. Some leading democrats, including Ex President Van Buren, have taken this same view, as I understand them; and I adhered to it, and acted upon it, until since I took my seat here; and I think I should still adhere to it, were it not that the President and his friends will not allow it to be so. Besides the continual effort of the President to argue every silent vote given for supplies, into an endorsement of the justice and wisdom of his conduct—besides that singularly candid paragraph, in his late message in which he tells us that Congress, with great unanimity, only two in the Senate and fourteen in the House dissenting, had declared that, "by the act of the Republic of Mexico, a state of war exists between that Government and the United States," when the same journals that informed him of this, also informed him, that when that declaration stood disconnected from the question of supplies, sixty seven in the House, and not fourteen merely, voted against it—besides this open attempt to prove, by telling the truth, what he could not prove by telling the whole truth—demanding of all who will not submit to be misrepresented, in justice to themselves, to speak out—besides all this, one of my colleagues (Mr. Richardson) at a very early day in the session brought in a set of resolutions, expressly endorsing the original justice of the war on the part of the President. Upon these resolutions, when they shall be put on their passage I shall be compelled to vote; so that I can not be silent, if I would. Seeing this, I went about preparing myself to give the vote understandingly when it should come. I carefully examined the President's messages, to ascertain what he himself had said and proved upon the point. The result of this examination was to make the impression, that taking for true, all the President states as facts, he falls far short of proving his justification; and that the President would have gone farther with his proof, if it had not been for the small matter, that the truth would not permit him. Under the impression thus made, I gave the vote before mentioned. I propose now to give, concisely, the process of the [facts and logic] examination I made, and how I reached the conclusion I did. The President, in his first war message of May 1846, declares that the soil was ours on which hostilities were commenced by Mexico; and he repeats that declaration, almost in the same language, in each successive annual message, thus showing that he esteems that point, a highly essential one. In the importance of that point, I entirely agree with the President. To my judgment, it is the very point, upon which he should be justified, or condemned. In his message of Decr. 1846, it seems to have occurred to him, as is certainly true, that title—ownership—to soil, or any thing else, is not a simple fact; but is a conclusion following one or more simple facts; and that it was incumbent upon him, to present the facts, from which he concluded, the soil was ours, on which the first blood of the war was shed. "But there are those who, conceding all this to be true, assume the ground that the true western boundary of Texas is the Nueces, instead of the Rio Grande; and that, therefore, in marching our army to the east bank of the latter river, we passed the Texan line, and invaded the teritory of Mexico." Now this issue, is made up of two affirmatives and no negative. The main deception of it is, that it assumes as true, that one river or the other is necessarily the boundary; and cheats the superficial thinker entirely out of the idea, that possibly the boundary is somewhere between the two, and not actually at either. A further deception is, that it will let in evidence, which a true issue would exclude. A true issue, made by the President, would be about as follows "I say, the soil was ours, on which the first blood was shed; there are those who say it was not." 1. 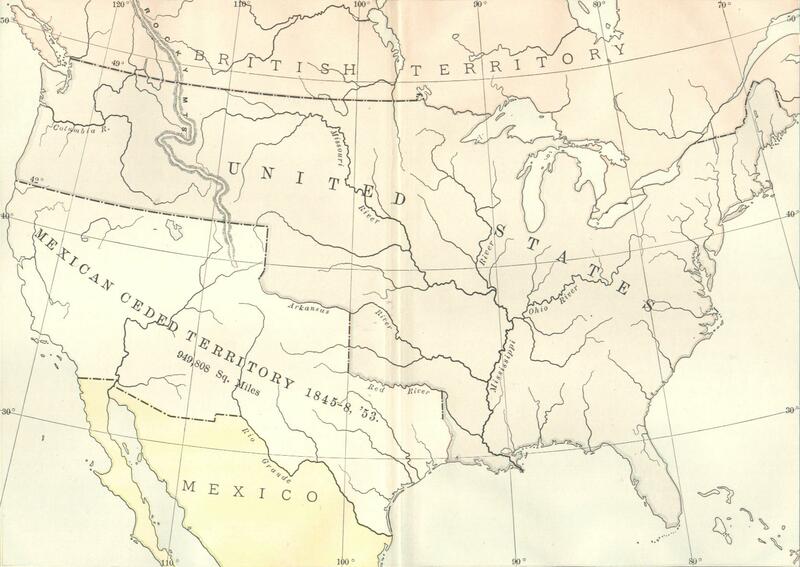 That the Rio Grande was the Western boundary of Louisiana as we purchased it of France in 1803. 2. That the Republic of Texas always claimed the Rio Grande, as her Western boundary. 3. That by various acts, she had claimed it on paper. 4. That Santa Anna, in his treaty with Texas, recognised the Rio Grande, as her boundary. 5. That Texas before, and the U. S. after, annexation had exercised jurisdiction beyond the Nueces—between the two rivers. 6. That our Congress, understood the boundary of Texas to extend beyond the Nueces. Now for each of these in its turn. [1.] His [President Polk's] first item is, that the Rio Grande was the Western boundary of Louisiana, as we purchased it of France in 1803; and seeming to expect this to be disputed, he argues over the amount of nearly a page, to prove it true; at the end of which he lets us know, that by the treaty of 1819, we sold to Spain the whole country from the Rio Grande eastward, to the Sabine. Now, admitting for the present, that the Rio Grande, was the boundary of Louisiana, what, under heaven, had that to do with the present boundary between us and Mexico? How, Mr. Chairman, the line, that once divided your land from mine, can still be the boundary between us, after I have sold my land to you, is, to me, beyond all comprehension. And how any man, with an honest purpose only, of proving the truth, could ever have thought of introducing such a fact to prove such an issue, is equally incomprehensible. [2.] His [the President's] next piece of evidence is that "The Republic of Texas always claimed this river (Rio Grande) as her western boundary[.]" That is not true, in fact. Texas has claimed it, but she has not always claimed it. There is, at least, one distinguished exception. Her state constitution,—the republic's most solemn, and well considered act—that which may, without impropriety, be called her last will and testament revoking all others—makes no such claim. But suppose she had always claimed it. Has not Mexico always claimed the contrary? so that there is but claim against claim, leaving nothing proved, until we get back of the claims, and find which has the better foundation. [3.] Though not in the order in which the President presents his evidence, I now consider that class of his statements, which are, in substance, nothing more than that Texas has, by various acts of her convention and congress, claimed the Rio Grande, as her boundary, on paper. I mean here what he says about the fixing of the Rio Grande as her boundary in her old constitution (not her state constitution) about forming congressional districts, counties &c &c.
Now all of this is but naked claim; and what I have already said about claims is strictly applicable to this. If I should claim your land, by word of mouth, that certainly would not make it mine; and if I were to claim it by a deed which I had made myself, and with which, you had had nothing to do, the claim would be quite the same, in substance—or rather, in utter nothingness. [4.] I next consider the President's statement that Santa Anna in his treaty with Texas, recognised the Rio Grande, as the western boundary of Texas. Besides the position, so often taken that Santa Anna, while a prisoner of war—a captive—could not bind Mexico by a treaty, which I deem conclusive—besides this, I wish to say something in relation to this treaty, so called by the President, with Santa Anna. If any man would like to be amused by a sight of that little thing, which the President calls by that big name, he can have it, by turning to Niles' Register volume 50, page 336. And if any one should suppose that Niles' Register is a curious repository of so mighty a document, as a solemn treaty between nations, I can only say that I learned, to a tolerable degree [of] certainty, by enquiry at the State Department, that the President himself, never saw it any where else. By the way, I believe I should not err, if I were to declare, that during the first ten years of the existence of that document, it was never, by any body, called a treaty—that it was never so called, till the President, in his extremity, attempted, by so calling it, to wring something from it in justification of himself in connection with the Mexican war. It has none of the distinguishing features of a treaty. It does not call itself a treaty. Santa Anna does not therein, assume to bind Mexico; he assumes only to act as the President-Commander-in-chief of the Mexican Army and Navy; stipulates that the then present hostilities should cease, and that he would not himself take up arms, nor influence the Mexican people to take up arms, against Texas during the existence of the war of independence. He did not recognise the independence of Texas; he did not assume to put an end to the war; but clearly indicated his expectation of its continuance; he did not say one word about boundary, and, most probably, never thought of it. It is stipulated therein that the Mexican forces should evacuate the teritory of Texas, passing to the other side of the Rio Grande; and in another article, it is stipulated that, to prevent collisions between the armies, the Texan army should not approach nearer than within five leagues—of what is not said—but clearly, from the object stated it is—of the Rio Grande. Now, if this is a treaty, recognising the Rio Grande, as the boundary of Texas, it contains the singular feauture [sic], of stipulating, that Texas shall not go within five leagues of her own boundary. [5.] Next comes the evidence of Texas before annexation, and the United States, afterwards, exercising jurisdiction beyond the Nueces, and between the two rivers. This actual exercise of jurisdiction, is the very class or quality of evidence we want. It is excellent so far as it goes; but does it go far enough? He tells us it went beyond the Nueces; but he does not tell us it went to the Rio Grande. He tells us, jurisdiction was exercised between the two rivers, but he does not tell us it was exercised over all the teritory between them. Some simple minded people, think it is possible, to cross one river and go beyond it without going all the way to the next—that jurisdiction may be exercised between two rivers without covering all the country between them. I know a man, not very unlike myself, who exercises jurisdiction over a piece of land between the Wabash and the Mississippi; and yet so far is this from being all there is between those rivers, that it is just one hundred and fifty two feet long by fifty wide, and no part of it much within a hundred miles of either. He has a neighbour between him and the Mississippi,—that is, just across the street, in that direction—whom, I am sure, he could neither persuade nor force to give up his habitation; but which nevertheless, he could certainly annex, if it were to be done, by merely standing on his own side of the street and claiming it, or even, sitting down, and writing a deed for it. [6.] But next the President tells us, the Congress of the United States understood the state of Texas they admitted into the union, to extend beyond the Nueces. Well, I suppose they did. I certainly so understood it. But how far beyond? That Congress did not understand it to extend clear to the Rio Grande, is quite certain by the fact of their joint resolutions, for admission, expressly leaving all questions of boundary to future adjustment. And it may be added, that Texas herself, is proved to have had the same understanding of it, that our Congress had, by the fact of the exact conformity of her new constitution, to those resolutions. I am now through [refuting] the whole of the President's evidence [for starting the aggression against Mexico]; and it is a singular fact, that if any one should declare the President sent the army into the midst of a settlement of Mexican people, who had never submitted, by consent or by force, to the authority of Texas or of the United States, and that there, and thereby, the first blood of the war was shed, there is not one word in all the President has said, which would either admit or deny the declaration. This strange omission, it does seem to me, could not have occurred but by design. My way of living [as a lawyer trained in logic and fact analysis and in detecting others' misrepresentations and logic errors] leads me to be about [present in] the courts of justice; and there, I have sometimes seen a good lawyer, struggling for his client's neck, in a desperate case, employing every artifice to work round, befog, and cover up, with many words, some point arising in the case, which he dared not admit, and yet could not deny. Party bias may help to make it appear so; but with all the allowance I can make for such bias, it still does appear to me, that just such, and from just such necessity, is the President's struggle in this case. Some time after my colleague (Mr. Richardson) introduced the resolutions I have mentioned, I introduced a preamble, resolution, and interrogatories intended to draw the President out, if possible, on this hitherto untrodden ground. To show their relevancy, I propose to state my understanding of the true rule for ascertaining the boundary between Texas and Mexico. It is, that wherever Texas was exercising jurisdiction, was hers; and wherever Mexico was exercising jurisdiction, was hers; and that whatever separated the actual exercise of jurisdiction of the one, from that of the other, was the true boundary between them. If, as is probably true, Texas was exercising jurisdiction along the western bank of the Nueces, and Mexico was exercising it along the eastern bank of the Rio Grande, then neither river was the boundary; but the uninhabited country between the two, was. The extent of our teritory in that region depended, not on any treaty-fixed boundary (for no treaty had attempted it) but on revolution. Any people anywhere, being inclined and having the power, have the right to rise up, and shake off the existing government, and form a new one that suits them better. This is a most valuable,— most sacred right—a right, which we hope and believe, is to liberate the world. Nor is this right confined to cases in which the whole people of an existing government, may choose to exercise it. Any portion of such people that can, may revolutionize, and make their own, of so much of the teritory as they inhabit. More than this, a majority of any portion of such people may revolutionize, putting down a minority, intermingled with, or near about them, who may oppose their movement. Such minority, was precisely the case, of the tories of our own revolution. It is a quality of revolutions not to go by old lines, or old laws; but to break up both, and make new ones. As to the country now in question, we [allegedly] bought it of France in 1803 [France did not own it, could not sell it!! ], and sold it to Spain in 1819, according to the President's statements. After this, all Mexico, including Texas, revolutionized against Spain; and still later, Texas revolutionized against Mexico. In my view, just so far as she carried her revolution, by obtaining the actual, willing or unwilling, submission of the people, so far, the country was hers, and no farther. Now sir, for the purpose of obtaining the very best evidence, as to whether Texas had actually carried her revolution, to the place where the hostilities of the present war commenced, let the President answer the interrogatories, I proposed, as before mentioned, or some other similar ones. Let him answer, fully, fairly, and candidly. Let him answer with facts, and not with arguments. Let him remember he sits where Washington sat, and so remembering, let him answer, as Washington would answer. As a nation should not, and the Almighty will not, be evaded, so let him attempt no evasion—no equivocation. And if, so answering, he can show that the soil was ours, where the first blood of the war was shed—that it was not within an inhabited country, or, if within such, that the inhabitants had submitted themselves to the civil authority of Texas, or of the United States, and that the same is true df the site of Fort Brown, then I am with him for his justification. In that case I, shall be most happy to reverse the vote I gave the other day. I have a selfish motive for desiring that the President may do this. I expect to give some votes, in connection with the war, which, without his so doing, will be of doubtful propriety in my own judgment, but which will be free from the doubt if he does so. But if he can not, or will not do this—if on any pretence, or no pretence, he shall refuse or omit it, then I shall be fully convinced, of what I more than suspect already, that he is deeply conscious of being in the wrong that he feels the blood of this war, like the blood of Abel, is crying to Heaven against him. That originally having some strong motive—what, I will not stop now to give my opinion concerning—to involve the two countries in a war, and trusting to escape scrutiny, by fixing the public gaze upon the exceeding brightness of military glory—that attractive rainbow, that rises in showers of blood—that serpent's eye, that charms to destroy he plunged into it, and has swept, on and on, till, disappointed in his calculation of the ease with which Mexico might be subdued, he now finds himself, he knows not where. How like the half insane mumbling of a fever-dream, is the whole war part of his late message! At one time telling us that Mexico has nothing whatever, that we can get, but teritory; at another, showing us how we can support the war, by levying contributions on Mexico. At one time, urging the national honor, the security of the future, the prevention of foreign interference, and even, the good of Mexico herself, as among the objects of the war; at another, telling us, that "to reject indemnity, by refusing to accept a cession of teritory, would be to abandon all our just demands, and to wage the war, bearing all its expenses, without a purpose or definite object[.]" So then, the national honor, security of the future, and every thing but teritorial inderrmity, may be considered the no-purposes, and indefinite, objects of the war! But, having it now settled that teritorial indemnity is the only object, we are urged to seize, by legislation here, all that he was content to take, a few months ago, and the whole province of lower California to boot, and to still carry on the war—to take all we are fighting for, and still fight on. Again, the President is resolved, under all circumstances, to have full teritorial indemnity for the expenses of the war; but he forgets to tell us how we are to get the excess, after those expenses shall have surpassed the value of the whole of the Mexican teritory. So again, he insists that the separate national existence of Mexico, shall be maintained; but he does not tell us how this can be done, after we shall have taken all her teritory. Lest the questions, I here suggest, be considered speculative merely, let me be indulged a moment in trying [to] show they are not. The war has gone on some twenty months; for the expenses of which, together with an inconsiderable old score, the President now claims about one half of the Mexican territory; and that, by far the better half, so far as concerns our ability to make any thing out of it. Ed. Note: Mexico used to extend up to Oregon on the North! and to Louisiana on the East! The result of the U.S. aggression against Mexico, as Lincoln is here saying, was (as verified in history) to take 50% of its territory. The U.S. “took half“ of Mexico, says Prof. Howard Zinn, A People's History of the United States (New York: Harper and Row, 1980, reprinted, HarperPerennial, 1990), p 166. Actually, the U.S. took 52.8%, 904,273 square miles, in the War, leaving Mexico the remaining 807,137 square miles in 1848. Charles Sumner, True Grandeur of Nations (1845), pp 8-9, and 16. Rev. Parker Pillsbury, Acts of the Anti-Slavery Apostles (1883), pp 81 and 381. It is comparatively uninhabited; so that we could establish land offices in it, and raise some money in that way. But the other half is already inhabited, as I understand it, tolerably densely for the nature of the country; and all its lands, or all that are valuable, already appropriated as private property. How then are we to make any thing out of these lands with this encumbrance on them? or how, remove the encumbrance? I suppose no one will say we should kill the people, or drive them out, or make slaves of them, or even confiscate their property. How then can we make much out of this part of the teritory? If the prossecution of the war has, in expenses, already equalled the better half of the country, how long its future prosecution, will be in equalling, the less valuable half, is not a speculative, but a practical question, pressing closely upon us. "with a people distracted and divided by contending factions, and a government subject to constant changes, by successive revolutions, the continued success of our arms may fail to secure a satisfactory peace[.]" Then he [President Polk] suggests the propriety of wheedling the Mexican people to desert the counsels of their own leaders, and trusting in our protection, to set up a government from which we can secure a satisfactory peace; telling us, that "this may become the only mode of obtaining such a peace." But soon he falls into doubt of this too; and then drops back on to the already half abandoned ground of "more vigorous prosecution. ["] All this shows that the President is, in no wise, satisfied with his own positions. First he takes up one, and in attempting to argue us into it, he argues himself out of it; then seizes another, and goes through the same process; and then, confused at being able to think of nothing new, he snatches up the old one again, which he has some time before cast off. His mind, tasked beyond its power, is running hither and thither [schizophasically], like some tortured creature, on a burning surface, finding no position, on which it can settle down, and be at ease. Again, it is a singular [peculiar] omission in this [Presidential] message, that it, no where intimates when the President expects the war to terminate. At its beginning, Genl. [Winfield] Scott [the ranking U.S. Army general] was, by this same President, driven into disfavor, if not disgrace, for intimating that peace could not be conquered in less than three or four months. But now, at the end of about twenty months, during which time our arms have given us the most splendid successes—every department, and every part, land and water, officers and privates, regulars and volunteers, doing all that men could do, and hundreds of things which it had ever before been thought men could not do,—after all this, this same President gives us a long message, without showing us, that, as to the end, he himself, has, even an imaginary conception. As I have before said, he [President Polk] knows not where he is. He is a bewildered, confounded, and miserably perplexed man. God grant he may be able to show, there is not something about his conscious, more painful than all his mental perplexity! For more by Lincoln, see his "Peoria Speech" (16 October 1854), and his "Special Session Message, July 4, 1861" noting, e.g., "The Union is older than any of the States, and, in fact, it created them as States." For context on U.S. wars, see background material. For inside information on war-motivation, by a general, see the book by Major General S. D. Butler, "War Is A Racket" (1931). For background on the South's slavery expansion goals, click here. Abolitionists were opposing the South's slavery expansion, e.g., Charles Sumner, Sen. Thomas Corwin, Rev. Parker Pillsbury, Rev. William Goodell, etc. See also, in the Mexican War context, Henry David Thoreaus' "Civil Disobedience" (1849). Not to overlook other examples, e.g., the events in the Mideast. Note that the ouster-of-invaders process can sometimes take centuries! While the invaders' descendants may forget what their ancestors did in terms of wars of aggression, the invaded peoples' descendants commonly do not forget! Thus simply as a matter of history, the U.S. can expect Mexicans to attempt to take back their invaded territory.